Here we go, another day another break! After traveling all around the globe, digging like a rabbit, I just want to go back home and rest for a while. Yes, this break comes from Italy, a land of great composers like Ennio Morricone (he received the Honorary Academy Award this year and I will give you a taste of his music in the future) and Giorgio Moroder. Only the last two exponents of an incredible Italian tradition. 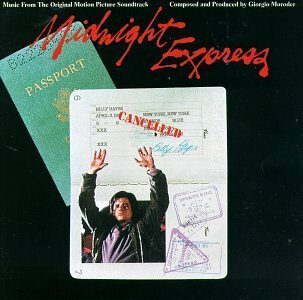 The today’s sample is (Theme from) Midnight Express, a theme included in Midnight Express: Music from the original motion pictures soundtrack. The movie obviously got the same name of the song and was directed by Alan Parker in the 1978. The movie is based on a true story and is about the bad experience of an American’s imprisonment in Turkey for smuggling hashish. I owned a vhs of this movie and so I can say it’s a nice one, expertly directed. But I am definitely not a movie expert so let’s go back to the music. Midnight express was sampled by Outkast in Return of the G, from the album Aquemini. Outkast are now a Pop phenomenon, an MTV’s product, but believe me, I used to be in love with them till Aquemini. Now they are truly garbage but in the ’90 they were the kings of the south, and we were all impressed by their innovative style. They dropped some of the most fresh hits I have ever heard. This entry was posted on Thursday, January 18th, 2007 at 12:48 pm. It is filed under Breaks, Hip Hop. You can follow any responses to this entry through the RSS 2.0 feed. Lo sapete che la stessa canzone e’ stata campionata dai Mobb Deep per Get Away, vero? Gia’ avevo in programma un mix di Moroder-Outkast-Mobb Deep… stay tuned! ka-ka-sh-ka 4753733 Modern view of virginia real estate. Peccato… il Link non funziona piu. Lo potete per caso sistemare? Magari in futuro posteremo altre cose simili a Beretta 70. Dato che sei Brasiliano, potresti consigliarmi qualcosa di funk/soul del tuo paese…so che ci sono cose veramente belle (le ho anche sentite quando due anni fa son stato in vacanza, in particolare a Salvador de Bahia) però ho bisogno di qualcuno che mi dia dei nomi da cui iniziare.